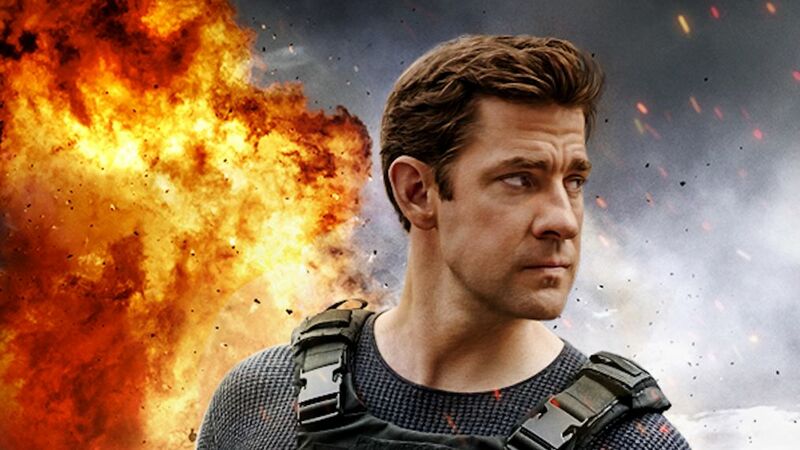 Bringing Tom Clancy's Jack Ryan to life on Amazon was complicated and time-consuming, to say the least. The project, which took over three-and-a-half years to bring to the small screen at Amazon, was spearheaded by executive producers Carlton Cuse and Graham Roland. They stopped by the TV Insider/TV Guide Magazine video studio at 2018 San Diego Comic-Con and chatted with West Coast Bureau Chief Jim Halterman about the upcoming action series. Plus, the official key art for the John Krasinski-starring Amazon series, premiering Labor Day weekend. "It was a huge undertaking. It's kinda like mounting a huge feature film... it's like a eight-hour movie," explained Cuse. "We spent the first year-and-a-half writing it. Then it took us a year-and-a-half to make it. We shot it in five cities on three continents," he added. "We had to actually go to the places. We couldn't cheat the audience," added Roland.